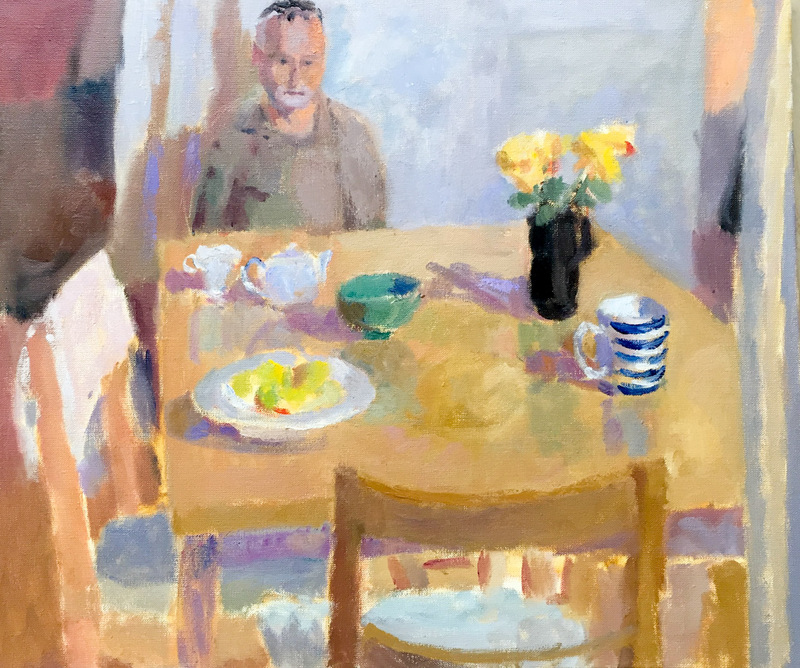 Bonnard is a painter who I much admire and I often marvel at his incorporation of figures into his paintings of domestic interiors. They sometimes seem to lurk -barely discernible as forms in the shadows. So I had been wondering about the possibilities myself - including some experimentation with a mirror. Within days of sharing this information with my friend Andy, who I originally met at art school in the 80s, he contacted me offering to sit. He was in the area that day and it wouldn’t be any inconvenience. Luckily I could adapt my day, and before Andy’s arrival I made a few decisions about where the painting would be set. I decided upon a view from the kitchen into the dining room – which had been catching my eye of late as the autumnal light lit up the table. It would also be warmer than the studio. I positioned myself in the kitchen, cursing somewhat at the splayed out legs of the Julian easel which is brilliantly stable outdoors but can be annoying in a confined space. We experimented with where Andy could be – eventually I asked him to sit at the end of the table where he was also directly in the light from the window. I arranged the flowers and objects on the table – and brought a chair to the foreground. I chose a square-ish canvas - as a more rectangular format didn’t lend itself to a composition. I used a viewfinder to help make these decisions. Having a sitter present, it became apparent how much time preparing the palette could actually take. In the end I stuck with basic mixes. To begin with the figure was only a few brush marks as I worked on the whole composition. As we neared the end point of Andy’s stay, I began to focus more on him – moving through various versions finally settling on the third. Andy headed off and I intended to continue with the rest of the painting, having enjoyed the session very much. However I only got so far before I noticed the light on the empty chair Andy had left behind. It dawned on me that the figure/interior composition that I’d found I was struggling with could work very well with the figure absent! In an instant I’d scraped off the paint, feeling as if I was demonstrating a rather cavalier attitude towards both Andy’s and my earlier efforts - but instantly felt happier with the picture. I also added another chair to the right of the table. On reflection, the painting I ended up with could perhaps have been interesting with a figure in the left top corner where there was a deep shadowy area which depicts the murky hallway. Perhaps the sort of thing I can imagine Bonnard doing. 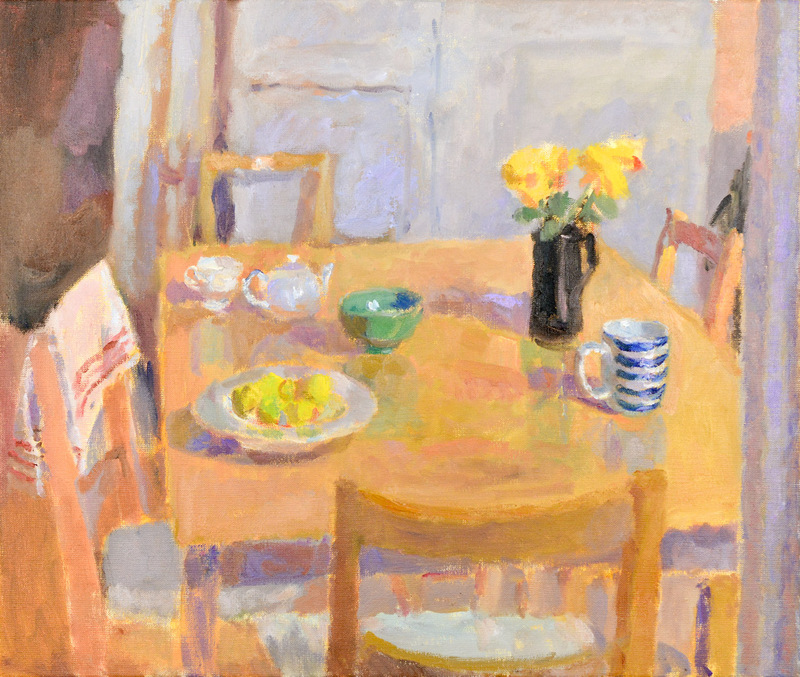 But my painting ended up being of a table - at which a friend had been sitting that morning while I’d been painting. Would my final painting - which depicted the space Andy had left behind - be the same picture if I’d painted it from the start without him being there? I like to think it wouldn’t.